The folks at IK Multimedia are continuing to push the envelope with tools that are shrinking the gulf between iOS devices and computers for musicians. A long time user of their interfaces and microphones, I am looking forward to digging in with a full review of their new Groove controller. I am also looking forward to putting the iLoud portable monitor system through some paces as well. Look for my full review to be submitted to all the terrestrial, online and print outlets I work with. 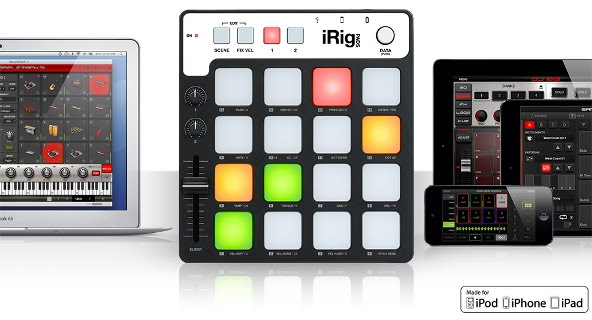 September 25, 2014 – IK Multimedia, the leader in mobile music creation apps and accessories, today announced it’s shipping iRig® Pads, the full-featured, ultra-portable MIDI groove controller for iPhone, iPad and iPod touch as well as Mac and PC. It’s the perfect companion for the mobile electronic music producer on the move: Now you can make beats, grooves and mixes anywhere you go. iRig Pads is designed to be effortlessly portable. It’s smaller than an iPad and less than 1″ thick – it’s the smallest groove controller in the market. It has a slim, compact form factor and it’s lightweight, which means that it can be slipped into any iPad or laptop bag or backpack and carried around with ease. For maximum portability, iRig Pads is a low energy consumption device – it draws its power directly from its host device and does not need a power source to be fully functional. It can be used with iPhone, iPad and iPod touch via its included Lightning cable (30-pin connector sold separately) without the need of an adapter as well as Mac and PC via its included USB cable. *iRig Pads are currently being tested for iPhone 6 and iPhone 6 Plus compatibility. At the heart of iRig Pads is its 4×4 grid of 16 velocity-sensitive, backlit multicolor rubber pads. Each pad lights up in multiple colors – red, green, orange and every shade in between – depending on the velocity of your playing and the MIDI information sent by your chosen music app or software. But iRig Pads does more than your average mobile pad-based MIDI controller. Its full spread of controls – two knobs, two buttons, one slider and one pushbutton rotary encoder – let you get creative. All controls are MIDI assignable and customizable: Up to 16 distinct MIDI maps or “scenes” can be saved, which allows for full control of apps and software on stage or in the studio. iRig Pads comes with 6 pre-programmed scenes designed to work with many of your favorite apps and software right out of the box. To help you get in the groove, IK is working to make iRig Pads the ultimate controller for beats, loops and more by adding support for a growing suite of powerful apps and software. iOS users will be able to make beats out of the box with the included SampleTank® free, and they’ll soon be able to control grooves and launch loops with GrooveMaker® 2 free for iPhone and iPad and remix their preferred tracks with DJ Rig™ free. On Mac/PC the included SampleTank 3 SE (worth $99.99/€79.99), available as a standalone and a plug-in virtual instrument for every major DAW, includes over 6.5 GB of sample contents, 400 instruments and 150 MIDI patterns, for a complete music production workstation, out of the box (coming soon as download from the IK user area). In addition, by registering their iRig Pads, users will be able to receive The Grid, an exclusive and free additional collection of 50 instruments (800 samples) and 50 MIDI patterns – designed exclusively for beat makers and groove performers who use iRig Pads – for SampleTank on iOS and Mac/PC (a value of $9.99/€7.99 for iOS and $39.99/€29.99 for Mac/PC). And that’s only scratching the surface – iRig Pads is also fully MIDI class-compliant, which means you can use it and customize its controls for use with virtually any MIDI-compatible app such as FL Studio Mobile, iMPC Studio and GarageBand or Mac/PC software such as MPC Studio, Ableton Live, Maschine, GarageBand and more. Previous: Previous post: Music Matters. . .
Next: Next post: Keg Johnson Jr.